Tributary to Trout Creek benefits from return of beavers in the Middle Deschutes Watershed. The screen is dark, with a jumble of grayish brush and ghostly branches in the foreground. Suddenly, a mass with glowing eyes and glistening fur stumbles through the clutter. One by one, small trees lurch across the ground, at first in the mouth of the furry creature and then, seemingly, of their own volition. In another clip, the only sound is echoed gnawing and chewing, as leaves tremble in front of the camera. 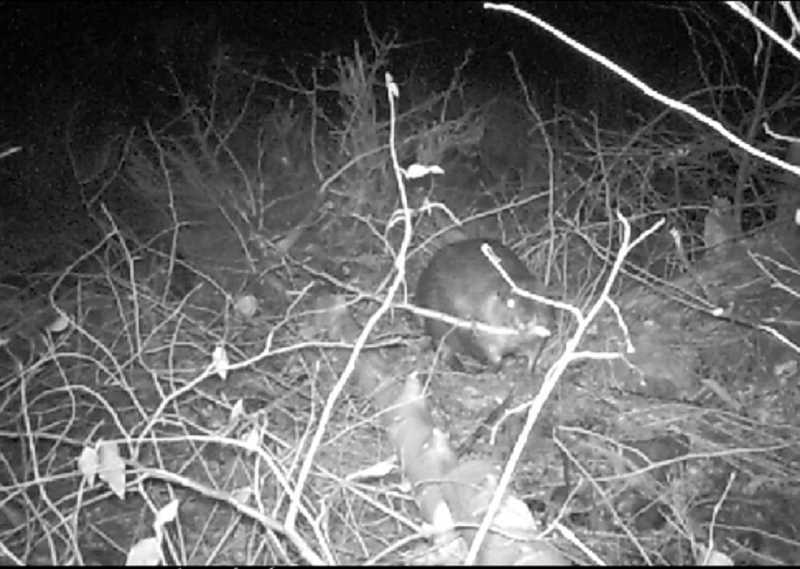 These are not the start to a film noir, though perhaps they could be — they're game camera footage of recent activity in our watershed by a critter we call Bucky the Beaver. Following a channel habitat improvement project spearheaded by the Jefferson County Soil and Water Conservation District in 2008, beavers like Bucky have returned in heartening numbers to a tributary of Trout Creek in the Middle Deschutes Watershed. 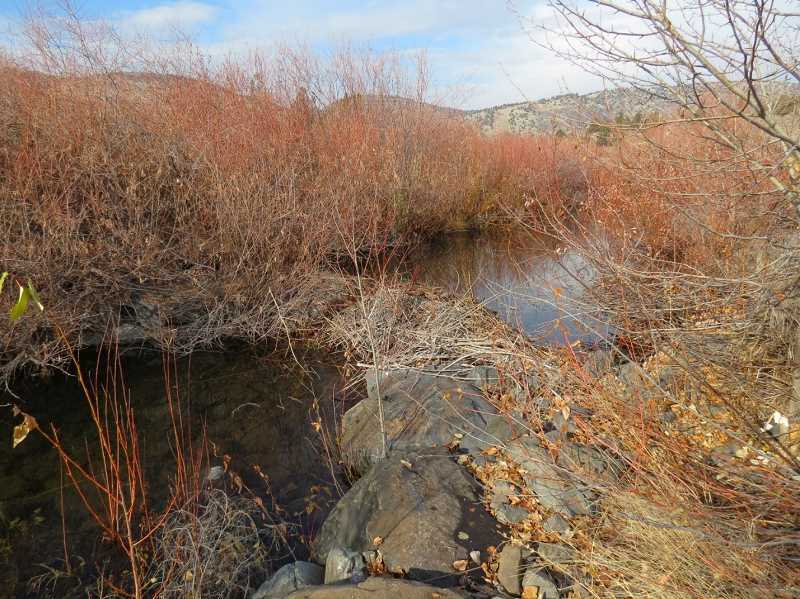 With the goals of increasing habitat for steelhead, improving water quality, and reducing problems with erosion along the creek, the project consisted of channel and floodplain reconstruction and shaping, followed by revegetation with native grasses, forbs, shrubs and trees. Through the project, around 30 acres of land were enrolled in the Farm Service Agency's Conservation Reserve Enhancement Program to continue conservation practices on the site for 15 years, and 20,000 native trees and shrubs were planted. The vegetation and channel restoration, which was funded by Portland General Electric, Bonneville Power Administration, and the U.S. Department of Agriculture, has been so successful in creating riparian habitat that there are now 75 beaver dams along a one-mile stretch of creek in the area, compared with zero before the project began. This is a great sign, because where beavers live, they are able to raise the water table, improve water quality, and maintain healthy riparian zones — all for free! In 2018, one of the driest years in four decades, one reach of this creek that has gone dry every year since at least 1998 became a perennial stream for the first time in decades. A landowner on the project site had enough water last year to irrigate pastures normally all summer long, instead of having to quit or reduce sprinkler use, as has been the norm in past years. Beavers are well-known for their construction of dams and felling of trees. These engineering habits of theirs have been part of a contentious history with European settlers in the United States. North American beaver population numbers plummeted from estimates of up to 400 million beavers prior to European settlement, to near extinction in many parts of the country by around 1900. Beavers were a favorite of trappers and hunters because of their pelts, which could be made into fur hats that were all the rage in Europe, and their oil glands, which were used in perfumes. Since the early 1900s, there has been a stronger emphasis in the U.S. on protecting beavers, but bringing beavers back to regions that have been developed in their absence can cause some troubles. When beavers' wetland homes overlap with places that people like to keep dry, like roads and houses, a common solution has been to simply eliminate them. Today, people are increasingly recognizing the importance of beavers in the landscape. These creatures are masterful engineers, and as it turns out, they play an important role in watershed health by forming wetlands that store and filter water and create habitat for wildlife. This is especially important in the West, where draughts and water scarcity are pressing issues. In our region, the wetlands that are created when beavers build their dams provide water sources in dry places for livestock and wildlife; they form oases of biodiversity and habitat for species like steelhead that are important economically and culturally; they hold water in place, which replenishes groundwater sources and makes more water available later in the season; and they filter water so that it enters our waterways cleaner. Lately, beavers are becoming an environmental celebrity of sorts with the publishing of the book "Eager: The Surprising, Secret Life of Beavers and Why They Matter," by Ben Goldfarb, news stories about projects such as the Bridge Creek Project in Oregon, the Martinez Beavers in California, and the Methow Valley Beaver Project in Washington, and most recently, the announcement that beavers will become a protected species in Scotland. That's not to say that the presence of beavers is always cause for celebration. Living close to active beavers can be challenging for a number of reasons: beavers can be a nuisance for timber, farms, and urban areas when they take down trees and accomplish engineering feats in the wrong locations, causing flooding, clogged culverts, or damage to valuable vegetation. There are nonlethal solutions to those issues, however. Important trees can be caged or fenced; beaver dam analogues can be installed strategically to encourage beavers to construct dams away from culverts; devices can be installed to prevent culvert clogs or regulate water levels; or the beavers themselves can be relocated to places where their landscape maintenance services are desired. - Oregon Department of Fish and Wildlife, "Living with Beavers,"www.dfw.state.or.us/wildlife/living_with/beaver.asp. - USDA Extension, "Beavers," icwdm.org/handbook/rodents/ro_b1.pdf. - Martinez Beavers, "Beaver Solutions," www.martinezbeavers.org/wordpress/solutions. - The Beaver Institute, "Beaver Management," www.beaverinstitute.org/management/overview. And if you want to learn more about beavers and hear from experts in the area, save the date! The Middle Deschutes Watershed Council will be screening the movie, "The Beaver Believers," by Tensegrity Productions, at 7 p.m. April 17, at the Jefferson County Library Rodriguez Annex. Refreshments will be provided, and discussion will follow the film screening. The event is free to the public, but donations are welcome. The Middle Deschutes Watershed Council is a community-based organization representing a broad range of stakeholders who live, work and recreate in the Middle Deschutes Watershed. Its mission is involving local people to enhance and protect the natural resources of the Middle Deschutes Watershed. Learn more at MiddleDeschutesWatershedCouncil.org. Kate Wellons is a program assistant for the Middle Deschutes Watershed Council.